"This neighborhood is ground zero for the fight that we're having all over the country..." ...Read More. 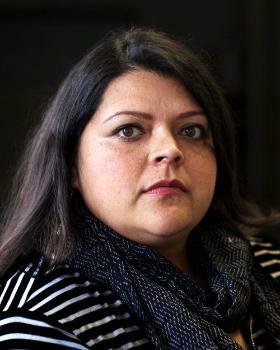 Olga is a mother of two and part of the Southeast Chicago Environmental Task Force, co-founder of the Southeast Chicago Coalition to Ban Pet-Coke, and founder of Rebel Belles. "When I came back to Grey's Harbor, I was surprised to see so many millennials on the street. People of my generation..." ...Read More. Reverend Sarah is a pastor at Champlains on the Harbor in Westport, WA. "We're at a critical moment in time. Our immigrant communities are being persecuted..." ...Read More. Fernando is the Executive Director for the Border Network for Human Rights at the US/Mexico Border. The organization is 18 years old, active since Fernando founded the Network in 1998. Carolina Gaete is a co-founder of Blocks Together Chicago, which empowers residents to take action to better their communities. Edward Ward is a Youth City Council Member at Blocks Together, and has been a member since he was in high-school. Edward testifies before congress on the school-to-prison pipeline. Anthony is an attorney, community organizer, and champion for the homeless. My father ... fought as a Korean veteran for democracy... and he wasn't going to come back home and not have it." ...Read More. Catherine flowers is a veteran, teacher, and water warrior. She visited Standing Rock in 2016. "...If you can live this life and be the person you want to be... that's way more powerful than flying through the sky with a cape..." ...Read More. Garrett is a veteran, water warrior, and father, who stands up for peace and a better future for his son.